Happy because…had a great time with the kiddos. 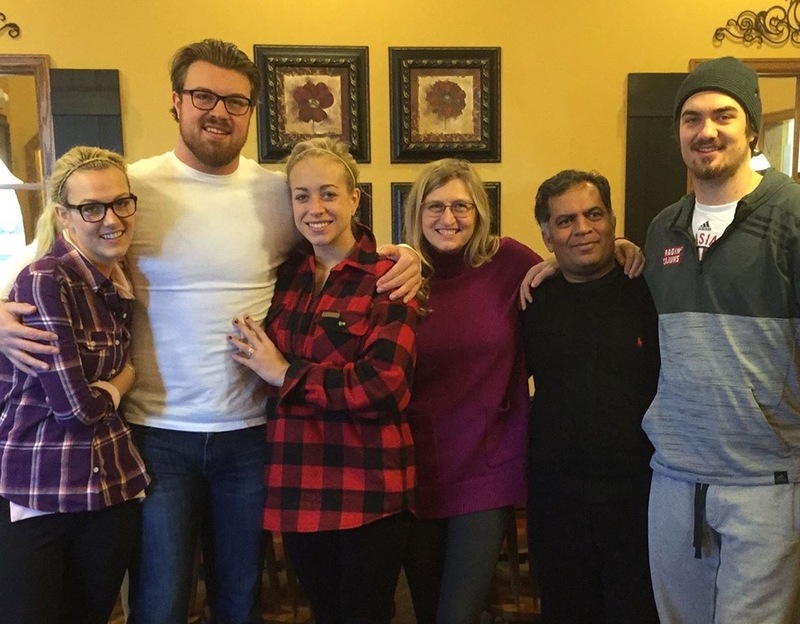 Congrats to Jake on his engagement to Emma, on his right. (Just love her). 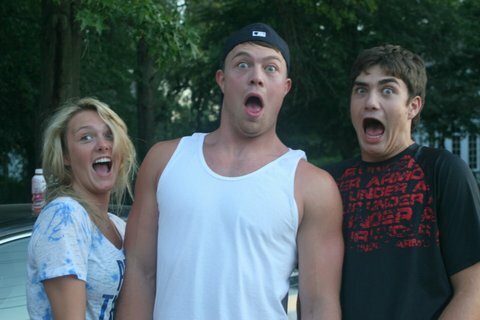 Daughter Betsy (WTG 4.0 in Grad School) to the left of Jake. My husband, Bishop Leo Michael, to my right and Nick (WTG Winning the New Orleans Bowl! Go Ragin Cajuns). Nick is the bookend wearing the hat. Hope to get back to more blogging this year where I focus on connecting with others. Thanks for following my blog. Interview: Best-Selling and Award Winning Author Dan Walsh! Yahoo! 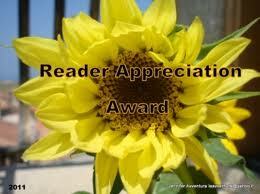 Recently, we were super-blessed at our local Kansas City chapter of American Christian Fiction Writers (ACFW)! Best-selling and award-winning author Dan Walsh (also an ACFW member) skyped into our monthly meeting from his home in Florida. He spoke about the craft of writing, and answered a few of our questions. (Psst…hang in there for a HUGE SURPRISE to come). 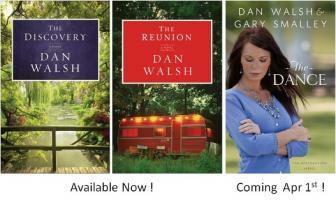 Dan Walsh writes contemporary and historical novels–mostly love stories and family-life dramas. He’s been called “the Nicholas Sparks of Christian Fiction,” and is often compared to Richard Paul Evans. Currently, he’s working on a novel with Dr. Gary Smalley (family counselor, president and founder of the Smalley Relationship Center and author of books on family relationships from a Christian perspective). AND…Guess what? Here’s the HUGE SURPRISE! I contacted Dan after the ACFW meeting and he granted me a personal interview! Woohoo! I’m so honored, especially since he’s also done interviews with media such as USA Today. 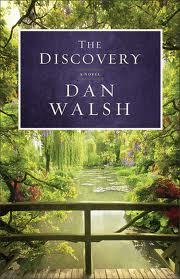 But before we delve into the interview, I’d love to share my story of how Dan Walsh’s books recently impacted my life. About a week after our ACFW meeting (where I first met Dan Walsh via Skype) I suffered a very painful back/nerve injury. Couldn’t walk for weeks, then only with a walker. 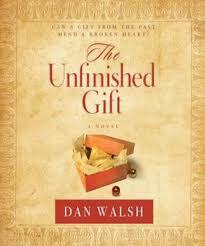 During my down time, I turned to Dan Walsh’s novels that I’d purchased on my Kindle. I devoured them like candy for the soul. Read three of them, then bought a few more. His books became my new addiction. 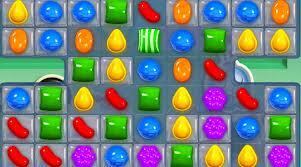 I even gave up Candy Crush and that is one addicting game! Dan Walsh’s books are way better than crushing candy. His fascinating plots and lovable characters stick with you. Sounds cliché-ish, but Dan’s books sucked me in from the first page, captured me, and held me to the last page and beyond. 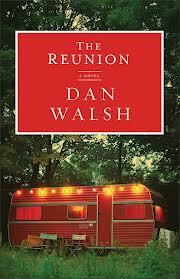 For days, I lived in Dan Walsh’s novels with these wonderful, believable characters. Themes of forgiveness, redemption, and love cut through my pain and warmed my heart. Like I said, soul candy. With all sincerity, each one of these books blessed me in its own unique way. And in my condition, grounded and in pain, I didn’t feel like writing. 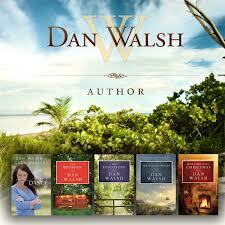 But thanks to Dan Walsh, I was not only captivated as a reader, but also inspired as a writer. Often “Aha” moments popped into my head on how to really write well. 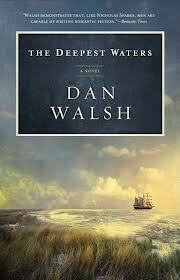 THE DEEPEST WATERS, based on real events, is an epic tale of a shipwreck and two lost lovers. What began as a fairytale honeymoon in 1857 for John and Laura Foster aboard the steamship SS Vandervere becomes a nightmare when a hurricane causes their ship to sink into the murky depths of the Atlantic. Laura finds herself with the other women and children aboard a sailing ship while John and a hundred other men drift on the open sea on anything they could grab as the Vandervere went down. Suspecting her John is gone but still daring to hope for a miracle, Laura must face the possibility of life alone–and meeting her new in-laws without their son if she ever reaches New York. 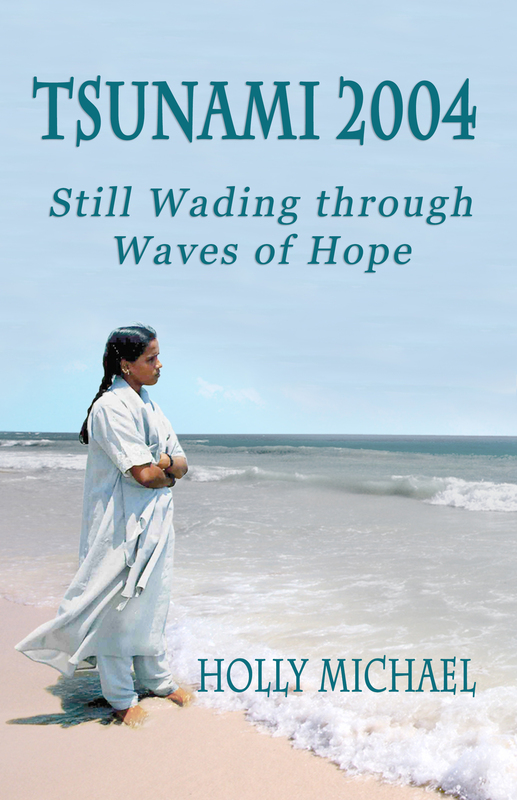 The Deepest Waters is an emotional and honest story of hope, faith, and love in the face of uncertainty. I read this one without stopping for food or sleep. Actually lost weight this day. Yay. Double blessing! THE REUNION. Aaron Miller was an old, worn-out Vietnam vet, a handyman in a trailer park. Forty years prior, he saved the lives of three young men in the field only to come home from the war and lose everything. But God is a master at finding and redeeming the lost things of life. Aaron is about to be found. And the one who finds him just might find the love of his life as well. Loved it! I wanted to morph into this book and hug these characters. They were people with real guts, who made me cheer them on, laugh and cry. THE DISCOVERY. Gerard Warner was not only a literary giant whose suspense novels sold in the millions, he was also a man devoted to his family, especially his wife of nearly 60 years. When he dies he leaves his Charleston estate to his grandson, Michael, an aspiring writer himself. Michael settles in to write his own first novel and discovers an unpublished manuscript his grandfather had written, something he’d kept hidden from everyone but clearly intended Michael to find. Michael begins to read an exciting tale about Nazi spies and sabotage, but something about this story is different from all of Gerard Warner’s other books. It’s actually a love story. This masterfully crafted book was my fav! Good thing I was stuck on the couch because I could not have tolerated setting down my Kindle in the middle of this one. THE UNFINISHED GIFT. Set at Christmastime in 1943, The Unfinished Gift tells in an engaging, simple style the story of a family, and reminds us of the surprising things that affect powerful change in our hearts–like a young boy’s prayers, a shoebox full of love letters, and even an old wooden soldier, long forgotten. This nostalgic story of forgiveness will engage readers everywhere. Don’t wait for Christmastime to read this one. It’ll make a wonderful Christmas gift, though. A can’t go wrong gift for women and men alike! Wonderful! 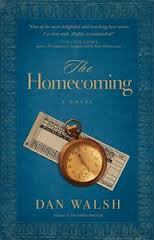 THE HOMECOMING is a sequel to The Unfinished Gift. No sooner is Shawn Collins home from the fighting in Europe than he’s called upon to serve his country as a war hero on a USO bond tour. Others might jump at the chance to travel all around the country with attractive Hollywood starlets. But not Shawn. He just wants to stay home with his son Patrick, his aging father and to grieve the loss of his wife in private. When Shawn asks Katherine Townsend, Patrick’s former social worker, to be Patrick’s nanny while he’s on the road, he has no idea how this decision will impact his life. Could it be the key to his future happiness and the mending of his heart? Or will the war once again threaten his chances for a new start? More heartwarming time with already beloved characters. And I loved the historical aspect. REMEMBERING CHRISTMAS. Rick Denton lives his life on his terms. He works hard, plays hard, and answers to no one. So when his mother calls on Thanksgiving weekend begging him to come home after his stepfather has a stroke, Rick is more than a little reluctant. He’s never liked Art and resents the man’s presence in his life, despite the fact that his own father abandoned the family when Rick was just twelve. When what was supposed to be just a couple of days helping out at the family bookstore turns into weeks of cashing out old ladies and running off the homeless man who keep hanging about, Rick’s attitude sours even more. Still, slowly but surely, the little bookstore and its quirky patrons–as well as the lovely young woman who works at his side each day–work their magic on him, revealing to Rick the truth about his family, his own life, and the true meaning of Christmas. 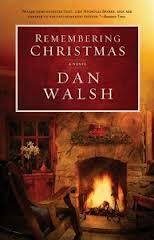 With skillful storytelling, Dan Walsh creates a Christmas story that will have readers remembering every good and perfect gift of Christmas. Another engaging heartwarming read to be enjoyed any time of the year. And now onto what we’ve all been waiting for: Dan Walsh! Holly: Welcome Dan! I’ve enjoyed many of your books and can’t wait to read more. Now, you’re co-authoring a book with Dr. Gary Smalley. Dan: Sure Holly. The Dance is the first of four books in the Restoration series I’m writing with Gary. It begins with what might appear to be a normal, healthy Christian family; but appearances can be deceiving. Jim and Marilyn Anderson have been married for twenty-seven years but, in many ways, their family relationship has been built on shifting sand. Like that metaphor Jesus uses in the gospels, throughout The Dance and the other books in the series the “winds and rains and storms” will beat against their house, and it falls. When the book opens, Jim is shocked to find Marilyn has left him, but not for another man. The things that have caused their marriage to drift to the point of collapse are very common things that can happen and do happen in many marriages. But the heart of the story, and the other books in the series (which will feature each of their adult children) is restoration. We will explore credible ways that God uses to mend lives and restore shattered dreams. Sorry, that was a long answer. Hard to summarize four books in a few lines. The shorter answer to your second question is that Gary had decided he wanted to do another fiction series similar to the wildly successful Redemption series he did with Karen Kingsbury. So he set his team on a mission to find someone who’s writing affected him the way Karen’s did. The outcome of that search led them to me. They gave Gary my first two novels to read. He called them while on a speaking trip a few days later saying he couldn’t put the books down and they had him crying at the end (in a good way). 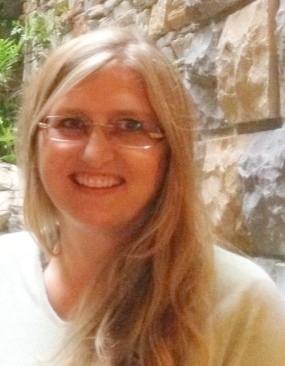 They called my publisher and extended an invitation to me, which I quickly accepted. Holly: Pretty cool that you made Gary Smalley cry. It’s a goal of mine to make a famous person cry someday. Speaking of making men cry, you write romance, but after reading your books, I’m convinced that men would enjoy your books as much as women would, maybe even shed a few man tears. 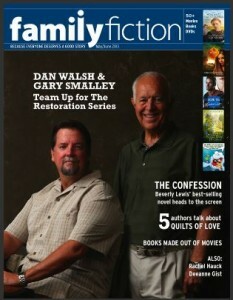 “They” say men don’t read romance, but besides Gary Smalley, do you find men among your many fans? Dan: I think many men don’t read romance, sadly, because men don’t typically read books written by women. It shouldn’t be that way, but there it is. And men won’t read a book with a cover that even looks like a book written for women. Which is why Gary and I objected to the direction the publisher wants to go with the Restoration series. We’ve written these books with more of a 50/50 focus, for both husbands and wives. They are deferring to the market reality, which we agree is true, that 80% of fiction readers are women. Hopefully, wives who love The Dance will be able to prevail upon their husbands to read it, too. We’re also aware that many men use Ereaders like the Kindle, so they don’t have the fear of people seeing them read a book with a woman on the cover. As for my other stand-alone novels, I do get a lot of feedback from men who really love my books (my other covers are more neutral). But still, I would say the ratio seems more like the 80/20 ratio I just mentioned. 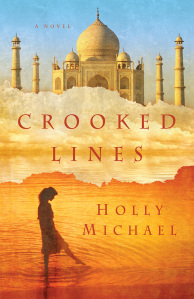 Holly: I’m suffering withdrawal symptoms now and am super-anxious to read more of your books. Please share what’s upcoming. Dan: Book 2 in the Restoration series, The Promise, is finished and due out in September. I’ve finished another standalone novel set in 1962, called What Follows After, due out next spring. At the moment, I’m writing Book 3 with Gary, then I’ll keep writing Book 4 after that. That should keep me busy for the next eleven months. Beyond that, I have one more Christmas novel to write on my contract (I already have 5 more book ideas roughed out for my next proposal, Lord willing). Holly: Wow, you’re a prolific writer. As a full-time writer, how much time do you spend each day actually writing? Dan: A typical day for me begins with a quiet time, then I spend about three hours taking care of all the miscellaneous support tasks for my writing life. Such as: emails, social media, marketing and publicity activity, etc. Then I’ll take a short break for lunch and spend the rest of the day writing the next chapter in my current book. So the actual time spent writing is about 4-5 hours. Holly: Better let you get to writing then! Thanks for agreeing to this interview. 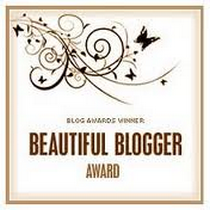 It’s been a pleasure and I’m sure my blog readers will enjoy your books as much as I did. Wow! So cool to interview the famous Dan Walsh. This expert story-teller also shared some gold nuggets of good writing when he Skyped into our ACFW meeting. I must share them. One of the greatest challenges is not actually the writing part, the creative part. It’s what happens after, as we try to get our book ready for the market. After the conferences, the how-to books, the critique partners, it comes down to you and what you put on the page. We don’t possess the ability to see ourselves accurately (the flawed lens). We must become an editor before we get an editor (actually, before we even get an agent. Great writing is great writing, but the world (and our audience) has changed. A concern about imitating contemporary heroes, too. Maybe you’ve seen some boring parts in some bestselling books and wonder if what I’m saying is really true (Hey look, these guys got published). You are not a bestseller, you don’t get to break the rules (not now anyway). Agents and Editors are readers, too. Remember the earlier point? Their time crunch? What do you suppose they do if your first chapter has “skipping parts?” What if the first chapter doesn’t, but they start showing up as they read on? On the flipside (the positive side)…what do you think they do when a book has no skipping parts? They keep reading…and reading…then ask for more (that’s what you want). This is why it’s critical for us to learn how to Self-Edit, especially how to recognize the Parts Readers Skip. Regarding the Setting…think movie scenes. Old way – every time you introduce a new character, take a paragraph or two to tell us what they look like. New way – don’t do that, anymore (a definite skipping part). A sentence or two, here and there at most, as part of a character’s thoughts, or work it in small doses during dialog. Showing vs Telling. Again, think movie scenes, not some narrator off to the side interrupting the action with clever observations. RUE – Resist the Urge to Explain (imagine intelligent people are buying your books, who don’t need everything explained to them). Make your characters sound like real people saying real things people might actually say. Not like proper British nobility or bad actors in B-movies. Goal is to make a prospective agent or editor forget they are reading a book. Read your dialog out loud (or let someone else read it back to you out loud). Any place you either skipped or were tempted to skip. Anything that slowed the story down or bored you. Any place you had to read more than once to understand. Any dialog that sounded phony or artificial (like bad actors talking). They will see things as they read, and they will have constructive/negative things to say. It’s up to you to convince them you really want and need to hear it. 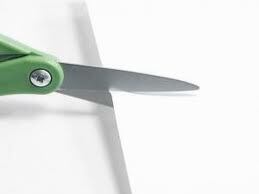 Then take all that good advice, get out the scissors, and begin to snip, snip, snip. Give your manuscript a total makeover. I feel weak sometimes. No, I feel weak a lot. I wasn’t always like this. For many years, I felt strong and confident. As it turns out, it was an illusion. I was like the Emperor in that Hans Christian Anderson story, “The Emperor’s New Clothes.” He isn’t wearing anything but, blinded by pride, he doesn’t see it. Now I do see it, and it’s made me aware of my weakness on a regular basis. Here’s an example: I’m beginning to write my 10th novel this week. Seven of the other nine are already published by major publishers (Revell and Guideposts). Novels eight and nine are in the pipeline, due out in 2013. I’ve already won three Carol awards (book-of-the-year). All of my novels have received rave reviews in magazines, blogs and on Amazon. 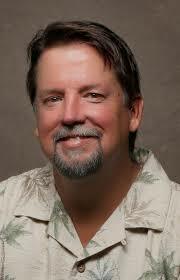 I’ve been asked to co-author a fiction series by a mega bestselling author (Gary Smalley). My most recent novel has been optioned by a movie producer who has made several Hallmark films. You’d think I’d feel confident inside as I set out to write a novel #10. But I don’t. I feel weak. I have doubts about whether I can do it again. What if I can’t? It’s my livelihood now. People are depending on me. What if the well runs dry? What will I do then? Where does such weakness come from? Was something missing from my childhood? Have I experienced some traumatic things as an adult that have eroded my self-confidence? The answer to both of these questions is “yes.” But that’s not why I feel weak. The real reason I feel weak, I believe, is a kindness from God. It’s not something I should dread but something I should celebrate. God, in His mercy, has lifted the veil of false confidence and self-sufficiency to help me see my true condition before Him. By design, I was made (you were made) to walk in a dependent relationship with God. It was Adam’s fall that created the illusion that we can make a success of things on our own. The truth is, God created us for intimate fellowship with Him. This need we have for Him is built-in, intended to continually draw us toward Him. We are hard-wired for dependence. And that is why we feel weak, when we feel weak. The good news is, because of Christ, the strength we lack is continuously available and in abundant supply. But we won’t benefit from this if we continue to walk in the illusion of strength (or should I say delusion of strength). We must learn the secret Paul learned, learn to become content with this feeling. In fact, woe to us if we ever lose the sense of weakness, because it’s the very thing that draws us near to God. How about you? Feeling weak and overwhelmed lately? Where does your heart go when you feel this way? May I suggest you go where Paul suggests? I’ve tried to make this my habit now, and it’s made a HUGE difference in my life. Lord, thank you for creating us this way, as dependent needy creatures. Help us not resent it but see it from Your perspective…as the very thing that draws us closer to You. Thank you for every situation–including the difficult people and circumstances–that make us more aware of our need for You. Fill us with your love and peace, and Your strength. Strengthen our grip on Your Hand. Thank you for always being there, day or night, no matter what. In Jesus’ Name, Amen. The Dance – Top Pick from RT Reviews/Released April 1st! 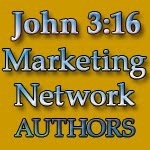 Thanks again Dan Walsh for sharing so much wisdom and thanks blog readers for stopping by.